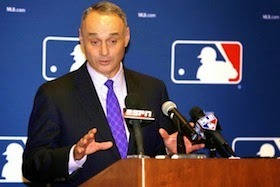 Was listening today to an interview with the new Major League Baseball commissioner Rob Manfred who was elected to take over the position last August after Bud Selig stepped down. Can’t say he was especially riveting to listen to as he addressed various “state of the game” questions, but afterwards my mind wandered a little into a couple of interesting memories from years past. I was concerned enough about the situation to write a letter to then MLB commissioner Bowie Kuhn, something I probably wouldn’t remember having done if not for the fact that Kuhn wrote me back. I have long lost both letters, but you can imagine what they both said -- mine expressing a desire they’d resolve the sucker and his registering my concern and stating his similar hope. I thought of that when hearing Manfred talk about how baseball fans contact him constantly -- some every single day -- with thoughts about the game and how it can be improved. I imagine he probably experiences that sort of thing much more often than Kuhn did back in those letter-writing days. A bit of trivia: Had history evolved differently, Richard Nixon could have been in the MLB Commissioner’s seat then as he was actually offered the job in 1965, which he turned down. 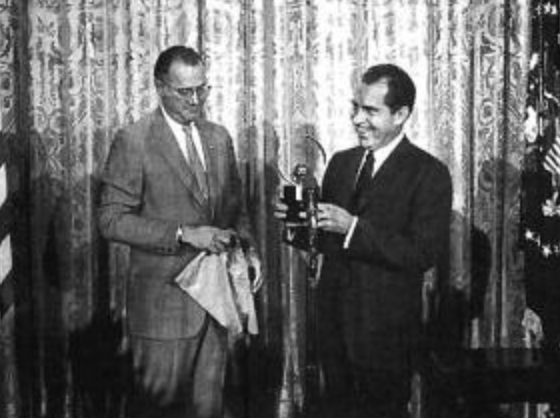 Later on, after both he and Kuhn took their respective offices in 1969, Kuhn presented Nixon a trophy honoring him as “Baseball’s Number 1 Fan” during a reception at the White House (pictured at left). I also found myself after listening to Manfred being interviewed thinking a bit about the World Series of Poker’s experiment with having a commissioner and Jeffrey Pollack’s tenure in that position which lasted from early 2006 through November 2009. Pollack first came from NASCAR to the WSOP in mid-2005, and somewhere in there -- perhaps just after he changed from being VP of Marketing to Commish -- there were rumors that Pollack was in fact angling one day perhaps to succeed Selig as the next MLB Commissioner. Some of Manfred’s PR-like talk about baseball made me think of Pollack and the rhetoric he employed -- often effectively -- when talking about poker in general and the WSOP in particular during those years. 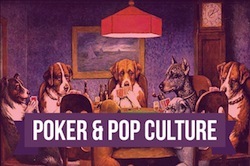 While many spoke favorably of him early on, later things soured a bit and his departure and subsequent involvement in the failed Epic Poker League helped influence many to conclude his influence on the game’s livelihood was mixed at best. I was thinking, though, about how we got used to having someone in what seemed an authoritative position -- even if it weren’t, really -- who was constantly addressing questions about the “state of the game” and thus by default carrying a kind of influence, if not on the game at least on how people thought about the game. 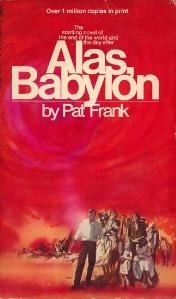 There are certain poker players who today perhaps occasionally seem to fill that role. I suppose Alex Dreyfus with his GPI-related ventures perhaps also does, too, as do those leading the EPT, WPT, WSOP, and other major tours and venues. But there’s no “commissioner” currently acting as the game’s “table captain” -- not that there actually can be, I don’t think. Which is okay. Until there’s a strike, then to whom will the kids send their letters? Back then there was still at least a thought that the commissioner actually had some power or influence over the owners.